Because of Easter, this month's breakfast will be on the 4th Saturday, rather than the 3rd. God calls all men to be strong, but not as the world defines strength. Every month we gather to take time away from our busy lives to grow in our faith that we might grow to be the right kind of strong. This is a time of good food, great fellowship, and a teaching that should help us all to grow in our faith. The STRENGTH TRAINING Men's Breakfast usually happens on the third Saturday of every month. Go to the Upcoming Events Calendar to confirm when the next one is happening. The cost is $10 per man. All men are welcome! Share this event with other men you know. 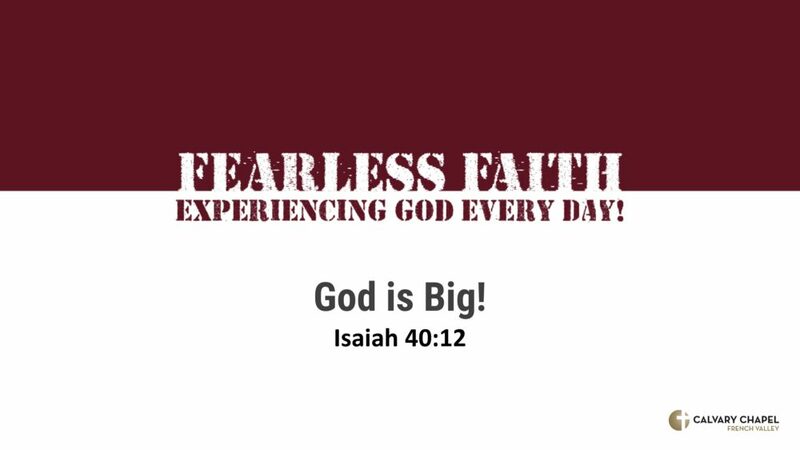 Pastor Rick Lancaster continues a topical series for men: FEARLESS FAITH! EXPERIENCING GOD EVERY DAY! To say that God is big is a gross understatement, but just how big is God, and what does that mean for us as men.? That is what Rick is going to attempt to address in this message for men. Ladies, there is something in it for you too! Rick is the Senior Pastor of Calvary Chapel French Valley in Murrieta, California. For more information about what is going on at Calvary Chapel French Valley, go to http://ccfv.life. Other things from the Men's Ministry! 7 ways to see God working around you!